If the universe is made of tiny atoms, then some of them are golden and have combined to land in the shape of France-based Ill River’s A Tale to Tell. This combination of blues, rock, funk and folk has something for just about everybody, resulting in the ideal introduction to the world as seen by lead vocalist, guitarist and banjoist, Cary T. Brown. Smile for the Picture is a song filled with joy, its lyrics painting a portrait that evolves as it moves through from the catchy intro and on to some awe-inspiring guitar work. Lucky Guy, too, is a gem. A solid pop number guaranteed to have the most reluctant tapping along in time. Again it is the musicianship of the collective – particularly that of Stephane Bonacci’s bass – which truly thrusts things forward. There’s an evocative nature to the album. A sense of promiscuity almost that lays within the mixtures of style and resilience. Hurt You is just plain angry, whereas On My Mind is as delicious a ballad as you could wish for. Sometimes gives into the call of the rockers in the ensemble. Jérôme Spieldenner’s thumping drum work is its guiding pulse, with Brown’s vocals smacking more than a bit of Peter Gabriel at his peak. The vibrancy of Janey is quite another story that is as luscious in its beauty as it’s simple sincerity, performance and composition. Sound engineer Jean-Marc Hauser has captured perfectly the very essence of this band. That they are passionate, hungry and very, very talented is beyond question. 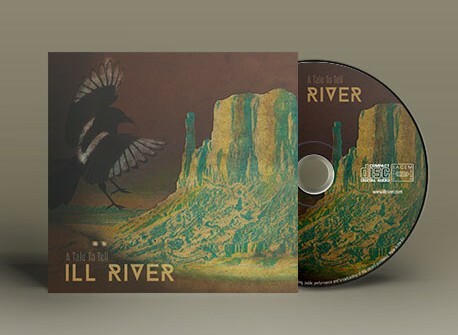 However, although the album is only available via direct mailing and despite the fact Ill River do not, as yet, have a management team other than themselves, that they’re not more widely recognised is more than a bit puzzling. Take a listen to poetry of arguably the strongest track, Little Strings – with its delicate balance of storytelling mixed with metaphors of other worldliness – and dare to be unimpressed: the depth and wealth of its imagery is astonishing. A match for Marillion’s Grendle opus, this is a track that sends gusts of chills and warmth in equal measures. Tie One On pretty much does what it says on the tin, with Once Upon A Time bringing a note of reverie that allows the listener to catch their breath a moment. It’s a short lived rest bite, however, with the closing My Favourite Season summoning up all that is good in this world. Ill River’s A Tale to Tell is that rare thing indeed. A composite that stretches the imagination, samples the texture of all things worthwhile and leaves the listener screaming for more. In a nutshell … cest magnifique!